Our next installment of Royals Insider focuses on the career of our 2007 Omaha backstop, Matthew David Tupman. Born in Concord, New Hampshire, Tupman attended the University of Massachusetts at Lowell before being selected by the Royals in the ninth round of the 2002 amateur entry draft. As a U-Mass Minuteman, Tupman was always considered a good-contact and patient but low-power hitter. That perception didn't change when he entered the Royals organization. Signed hours after the draft, Tupman was sent to Spokane, Washington, home of the then-Class A- Kansas City affiliate. In 170 at-bats in Spokane, Tupman hit .271/.364/.347 before being promoted to Class-A Burlington (IA) for the 2003 season. At age 23, Tupman regressed noticeably, committing 9 errors and allowing 14 passed balls and posting a paltry .592 OPS for the Bees. Nonetheless, in a classic Allard Baird-like move, Tupman was promoted the following year to the Wilmington Blue Rocks, despite in many Minor League fans' minds, not completely deserving it. It was in 2004 that Tupman experienced a minor breakthrough, raising eyebrows as a possible successor to a similar left-handed hitting catcher, Brent Mayne. Tupman slugged a career-high .400 in 330 AB's in Wilmington, hitting .300 and drilling 24 doubles. It was even more encouraging that Tupman's defense had improved slightly. The catcher would then spend the following two years receiving the majority of the playing time in Wichita, posting an underwhelming .689 OPS in 2005 and thrusting forward to the tune of a .789 OPS the following year. Tupman lost his true prospect status once and for all before the 2007 season, as he became more of an outside opportunity for the new regime of Dayton Moore. In 2007, Tupman received most of the playing time of previous catcher Paul Phillips, posting solid defensive numbers and posting an above-average +80 split between BA and OBP (.281 and .361, respectively). 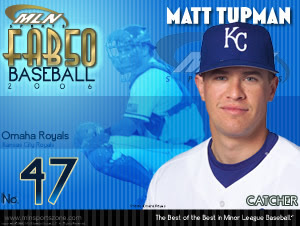 Nonetheless, Tupman has contributed in every Royals Spring Training since 2004, but has not contributed enough to truly be considered a viable catching option at the big-league level. Given the low demanding job that is the backup catcher position, Tupman could emerge in the next 2-3 years as a 30/40 game starter on an MLB squad. However, the chances of that happening are probably less than 50%. Could the 28-year old Matt Tupman finally receive his cup of coffee in 2008? - Minor League experience, ability to hit left-handed, and solid but unspectacular defense makes him a viable backup catcher option, an undemanding option to begin with. At this point, even the most sunny-eyed among the Royals faithful view Tupman as essentially nothing more than a possible September call-up in 2008. After the '08 season, it's unsure whether he'll even contribute in the organization. At best, he could emerge as a late-blossoming Brent Mayne, but provides limited upside in the power department. Tupman must hope for either a trade or an injury to either Olivo or Buck to emerge as a true backup catcher. In March, the organization will likely view him as a darkhorse at best to make the 25-man squad. Entering his age 29 season, Tupman will probably not improve considerably from his decent numbers in Omaha. But he's a viable outside candidate nonetheless. I expect to see Matt Tupman behind the plate at some point next season, albeit for merely a limited time.